I was able to capture this image in Pennsylvania over the Thanksgiving week. 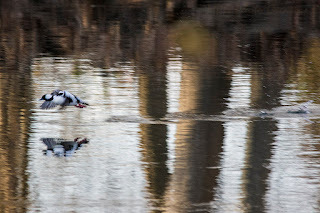 This was the second time I had ever seen a Hooded Merganser duck and both times were there. I captured it as it took off when it decided I was too close. I liked the out of focus, unfortunately, splash it left behind but I was trying to get the bird in focus so that was good.